To showcase food properly, put it on a pedestal - or better yet, in a wire pedestal basket from American Metalcraft. 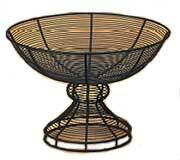 Available in black wire, these baskets measure 13" (33 cm) in diameter x 8 1/2" (21.6 cm) high. They're the perfect size for fruits, vegetables, and rolls.